Asian buyers increased investment within the U.S. market in 2015, particularly as the semiconductor space consolidated. According to Mergermarket intelligence, this outbound trend will continue in 2016, with the Chinese government pushing companies to upgrade technology through its "Made in China 2025" initiative. The worldwide Technology, Media and Telecommunications (TMT) market activity during 2015 reached an all-time high with 3,021 transactions valued at $768.3 billion, that's up by 46.6 percent by value compared to 2014 ($524.1B, 2,988 deals), according to the latest global study by Mergermarket. TMT mergers and acquisitions (M&A) increased its presence in global dealmaking, accounting for an 18 percent market share of total activity, up from 16 percent in 2014, and the second highest on Mergermarket record (since 2001) following 2013 (23 percent). M&A activity targeting the Technology sub-sector (2,225 deals, $421.6B), drove overall TMT value during 2015, increasing 88 percent compared to 2014 to reach both its highest deal value and count on Mergermarket record. The U.S. market was the most targeted country for Technology M&A activity, attracting $249.4 billion-worth of deals -- that's an increase of 92.1 percent compared to 2014 ($129.8B). ($223.9B, 194 deals), and 2.1 percent above 2013’s previous record ($254B, 239 deals). Similarly, Media (600 deals, $87.4B) reached its highest annual value since 2007, highlighting a spread of interest in deals throughout the TMT sector. According to the Mergermarket assessment, the U.S. continued to be the most active region globally (977 deals, $412.5B), achieving a peak in deal value, increasing its share in global TMT activity to 54 percent -- that's up from 46 percent in 2014. Asia-Pacific (excluding Japan) saw both its highest deal value and deal count on record with 783 deals worth $177.7 billion, that's a 149 percent increase by value compared to 2014 (575 deals, $41.4B), the previous record holder for deal value and count. 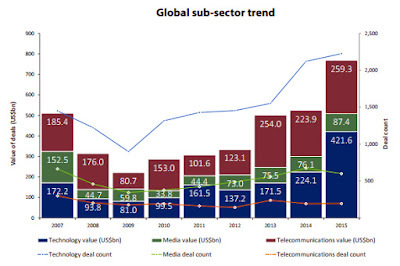 However, this M&A trend was not mirrored by European deal value ($157.9B, 967 transactions), which saw its share in global TMT activity fall to 21 percent, that's down from 31 percent in 2014. This represented a 1.4 percent decrease compared to 2014 ($160.1B, 978 deals). The drop in value was largely due to a decrease in activity in both the Media ($13.6B, 225 deals) and Telecommunications ($75.1B, 89 deals) sub-sectors which experienced annual decreases of 55.3 percent and 20.7 percent, respectively.